For surface engineers up for a challenge, bearing carriers for aircraft landing gear demand multiple and somewhat conflicting material properties: they need to have high strength yet be lightweight, extremely wear-resistant, and provide a low friction bearing surface. Titanium is a popular option for these parts due to its beneficial strength-to-weight ratio. Its tendency to cold-weld means that a coating is required to provide suitable tribological performance. Keronite scientists working on highly controlled variations of Plasma Electrolytic Oxidation (PEO) techniques took up the gauntlet. 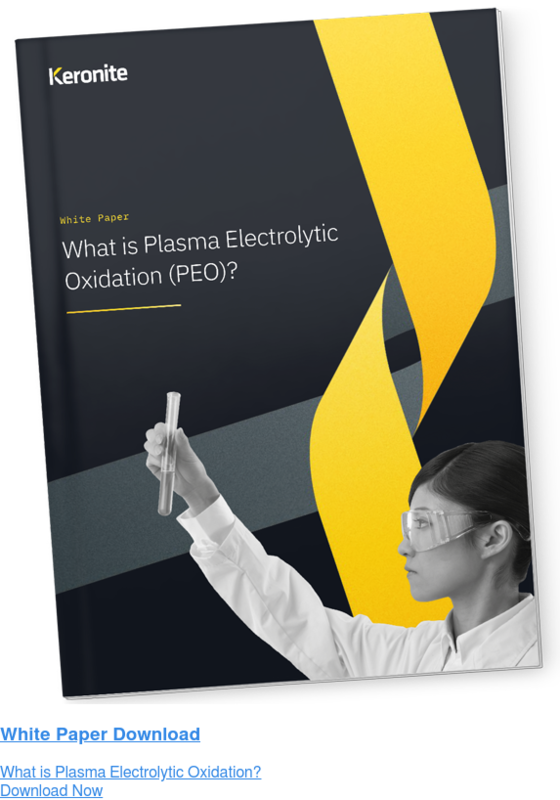 PEO is an exciting step beyond conventional anodising: the electrolytes tend to be chemically benign and the voltage used is high enough to form plasma reactions at the surface of the metal which modify the structure into a dense, hard-wearing ceramic layer. Keronite’s scientists experimented with coating surface morphology, hardness and duplex finishes on titanium to integrate high wear-resistance with excellent lubricity. Aerospace regulators have a strict quality control on landing gear: planes are routinely inspected, and all landing gear has to be removed and overhauled about every 10 years or 18,000 cycles, whichever comes first. The landing gear, including bearing carriers, is then shipped to specialist, qualified contractors for all necessary refurbishments, a costly process leaving planes out of action as new parts are manufactured and installed. Reducing this unproductive time is naturally of significant interest to airlines and other aircraft operators. Keronite received news that aeroplane maintenance technicians performing these overhauls were frustrated by the extent of refurbishment required by industry-approved titanium bearing carriers. The worn parts were sent to one of Keronite’s global work centres for inspection. New parts were made to specification and a new Keronite coating was applied. Once back at industry standard, the new part was returned to maintenance for installation within five days. As we’ll see, the results of the repairs would impress any equipment manufacturer. Keronite had already been making extensive use of the extremely wear- and corrosion-resistant properties of PEO coatings. Having received the technical details and specifications of the bearing carriers to be repaired, technicians set about maximising the potential lubricity of PEO coatings. One advantage of the PEO technique pioneered by Keronite is that it is easy to precisely control the process variables, such as temperature and current supplied, with a high degree of accuracy. Moreover, the coating produced is rather tolerant to changes in these variables compared to anodising or other electroplating processes, which helps to ensure very good repeatability. Calculating which variables would produce a substrate with optimum porosity, hardness and surface finish, Keronite scientists were able to graft a lubricant coating on top of the bearing carrier’s highly-resistant Keronite coating, forming a duplex coating. The Keronite laboratories produced dozens of samples, which were then extensively tested by the aircraft manufacturer itself. Parts were exposed to Taber and salt spray fog tests that simulated decades of harsh abrasive wear. When it was clear that they had created a coating that was up to standard, its use in the MRO sector was approved. Keronite’s coating process has now received industry qualification, meaning it can be applied directly to parts and save manufacturers on qualification costs. Keronite can guarantee technicians and manufacturers a rapid 5-day handover time on components, with global service centres to minimise time spent waiting for parts and planes to get where they need to be. With Keronite’s approach having met industry standards, the repair benefits to maintenance technicians can now be made use of by all manufacturers who want a robust and reliable duplex surface treatment for extremely resistant and lubricant parts. Keronite’s global service centres guarantee a 5-day turnaround time... Meanwhile, Keronite’s PEO research scientists continue to rethink what metals and surfaces are capable of.